With these systems the motor runs continuously. Duplicate motors and duplicate feeders are normally provided and in certain installations a change-over switch is provided so that each motor may be supplied by either feeder. Short circuit protection only is provided in these feeder circuits, the normal overload protection being replaced by an overload alarm. With these systems the gear will run and the rudder will continue to turn while the steering wheel or other controller is moved from its central position. Rudder movement is stopped only when the steering control is centred once again (or when the rudder is brought up against the stops). It will be obvious that placing the filler amidships merely stops application of helm and does not remove it. Removal of helm must be effected by moving the tiller to the opposite side. Controllers with non follow up systems take the form of a wheel or a tiller lever or push buttons. A rudder indicator is fitted to indicate rudder movement. With these systems movement of the rudder follows the movement of the steering controller e.g. if the controller is moved to indicate a desired rudder position the rudder will turn until the actual rudder angle is the same as the desired rudder angle shown on the steering pedestal after which rudder movement will cease, the controller remaining offset from its central position. With these systems the steering control circuits are controlled by signals received from the master compass, so that the ship is automatically held on to a selected course. Primarily the system is so arranged that when the vessel is on course the rudder is amidships but as soon as the compass indicates an error the auto pilot applies an amount of rudder sufficient to bring the vessel back on course. By the time the vessel is on course again the applied correcting rudder has been removed. With some systems, should it be required to alter the course being steered by the auto pilot by a few degree, this can be done by a Trim Switch and without necessarily reverting to hand steering. and its normal practice to fit at least two of the systems (i), (ii) and (iii). 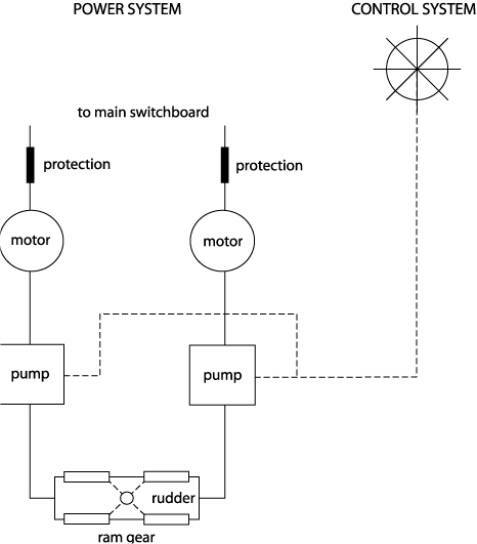 Fig indicates Follow Up, Non Follow Up and Auto Systems fitted to electro hydraulic power systems. i)Steering pedestal or bridge unit. This produces electrical impulses by operation of the steering control. ii)Amplifier or control unit to transmit these impulses to the steering flat. iii)After power unit to translate these impulses into mechanical movement of the power steering system.